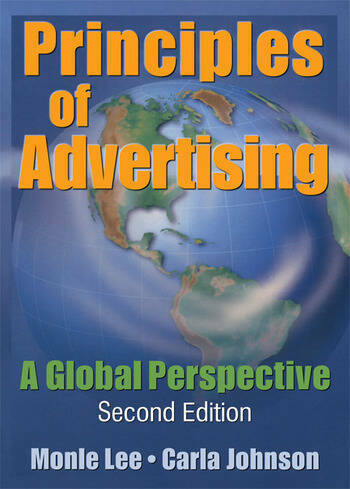 Principles of Advertising: A Global Perspective, Second Edition updates the classic first edition of this exceptional classroom resource, selected as one of CHOICE magazine’s Outstanding Academic Titles for 1999. Ideal for use as an introductory textbook, the book presents an integrated marketing approach that’s essential for keeping up with the changing world of contemporary advertising, and reflects the authors’ expertise not just in advertising, but also in the larger field of integrated marketing communications. The new edition of the book examines the environment in the advertising industry following the terrorist attacks on Sept. 11, 2001, as well as market segmentation, target marketing, product positioning, buyer behavior, legal and political concerns, the creative aspects of advertising, and much more. Principles of Advertising: A Global Perspective, Second Edition equips instructorsand their studentswith the fundamental elements of the field with emphasis on ethical issues. The book includes a foreword by Don E. Schultz of Northwestern University’s Integrated Marketing Communication program and provides insights into effective local, national, and global integrated marketing strategies for print, electronic, and online advertising. This updated edition maintains the original format for each chapter of featuring Global Perspectives, Ethics Tracks, and short commentaries from practitioners in various fields, and adds 24 new illustrations and more recent examples of now-famous advertising campaigns. behavioral targeting or online stalking? Principles of Advertising: A Global Perspective, Second Edition examines new theories, new technologies, well-known advertising campaigns, and cultural considerations for advertising in foreign markets to give your students current and proven information on the changing world of advertising. Ethics Track: Has the Top Pharmaceutical Advertiser Abused Its Power? Ethics Track: Advertising As Programming?